We not only receive donations and support at Gracie's Gowns, but we return the favor by giving back to hospitals and other organizations too. We believe when you are given a platform to reach families during their darkest time, that a responsibility comes with it to help others do the same. Giving back through the creation of items that can help make a hospital stay brighter not only allows us to reduce our fabric waste, but also serves our families in new ways. It stretches our donations farther; creating a greater social impact within the community we serve, but also externally through a variety of organizations as well. Our three consistent giving back programs are listed below - click on the buttons to learn more about each. 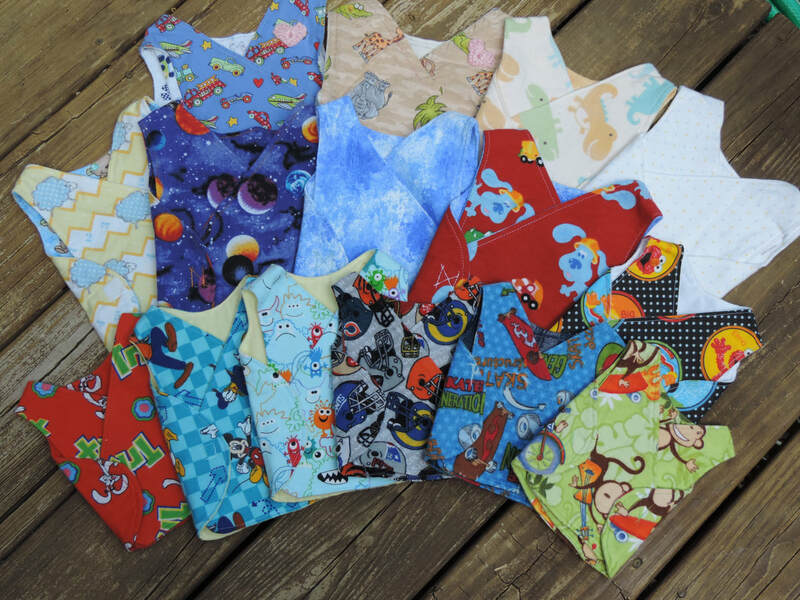 Our biggest way of giving back is creating NICU Smocks from remnant pieces of fabric for hospital nominated by families we serve. Gowns are made and donated to other organization as well throughout the year. The second way we give back is through making chemo bag covers, usable face masks, and collecting fund Band-Aids for Hematology/Oncology Clinics and Units creating a care package for the hospital. The final way we give back on a regular basis is by donating our remnant fabric from hospital gown requests that we are unable to use for or programs, or when we just have way too much leftover and cannot store it.